Below is a list of the activated objects from the start of the COTA-PA program on March 1, 2012. The activations are valid for the COTA-PA award and the World Castles Award. The table shows the number of times the object was activated, the number of QSOs logged in total from the object, the number of times the object was activated in the last two years and the activators. 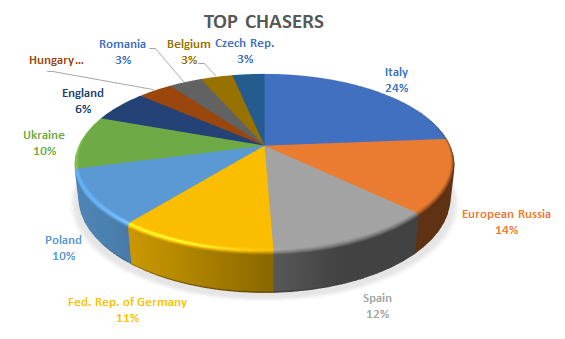 The chart below shows the DXCCs of the chasers that have most often found there way into castle activity logs in PA.
(*) Note that as of Sept 19, 2012 the reference list prepared by WCA for PA was cleaned up and renumbered. Only objects activated before that date retain their old (high) reference number.